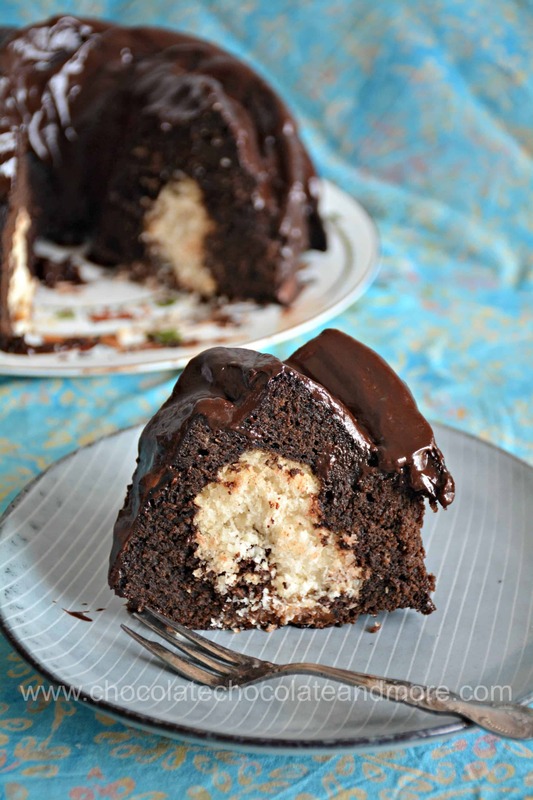 Chocolate Fudge Macaroon Bundt Cake - Chocolate Chocolate and More! 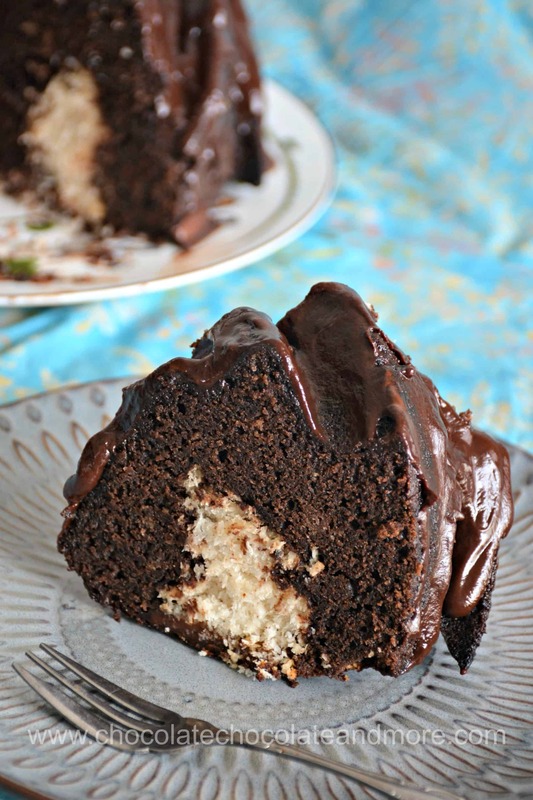 Chocolate fudge macaroon bundt cake may be small but it packs a flavorful punch. Moist chocolate cake with light crumb filled with succulent macaroon and topped with dark chocolate ganache makes for a mouth-watering dessert that your family will love. I love chocolate and coconut together. 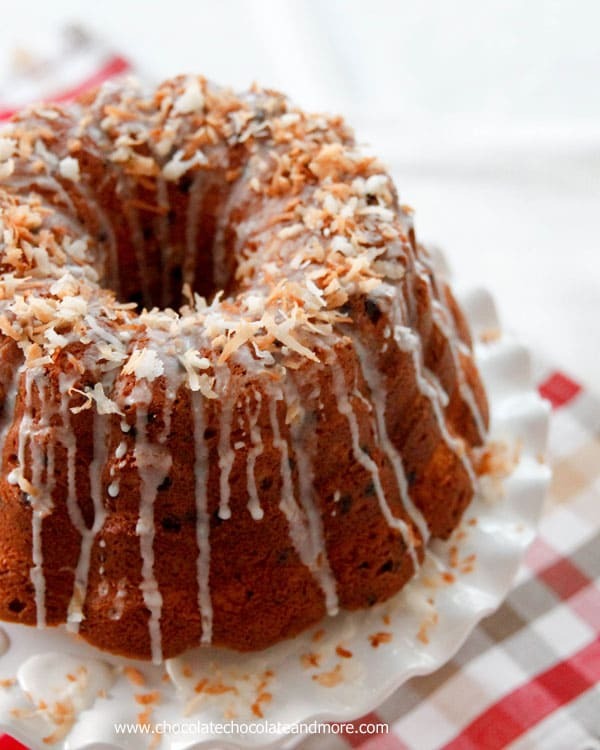 Coconut gives baked goods a wonderful texture and flavor. So I’ve been wanting to make this cake for some time. I polled our Facebook group and they ranked this as their first choice for new recipes too. So why the wait? Well this cake took several tries to get right. I figured out the macaroon filling on the first try. It’s so simple just like the cookie – coconut, egg whites and a little sugar. The problem was the cake. The first cake I made stuck to the pan. I mean really stuck to the pan. It tasted great but all the buttering and flouring and letting it cool in the pan a bit before removing didn’t work. We’re all busy so, if you’re going to make a cake from scratch, it should come out of the pan. I baked mine in a silicone pan and the batter is heavy enough that it caused the pan to bulge. You can see that the left side of the cake is a bit bigger than the right side in the photo below. Removal from the silicone pan was pretty easy but use a metal pan if you want better results. I meet a group of friends every Wednesday for dinner. This gathering and work are my tasting groups. If they like it, it’s good enough to put here. 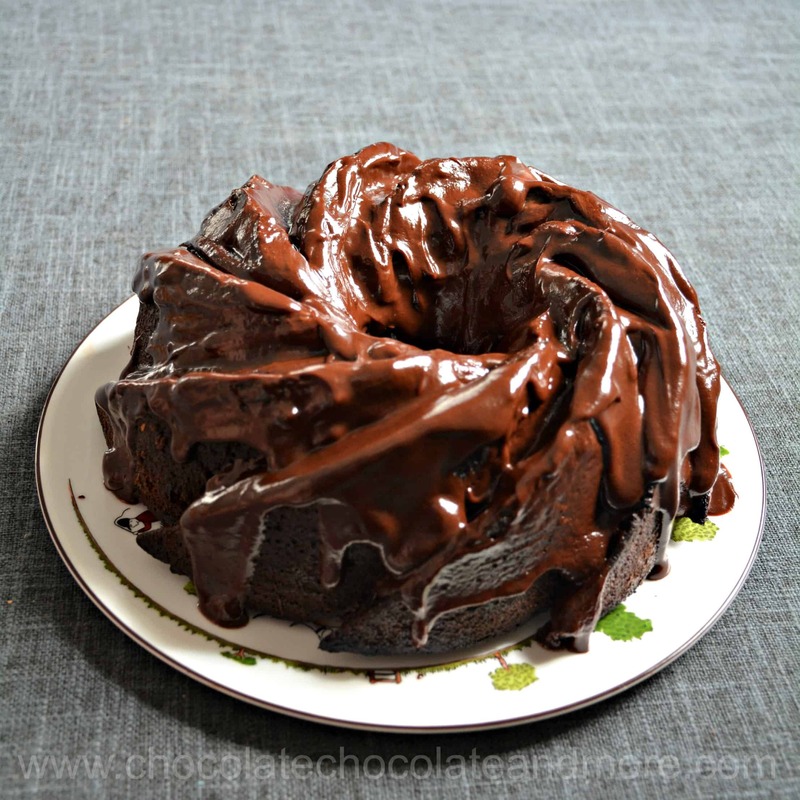 This chocolate fudge macaroon bundt cake was a hit at the Wednesday dinner party. I saw people using their fingers to get the crumbs off their plates. You know it’s good when manners go out the window. To make sure the cake didn’t stick, I mixed melted butter and flour together and used my fingers to grease the pan. I made sure I got it all. Then I let the cake cool in the pan until it was lukewarm. It came out perfectly. Beat egg whites until frothy. Add pinch of cream of tartar and beat until soft peaks form. Add salt and vanilla and sift in powdered sugar. Beat until stiff but not dry peaks form. Fold in coconut and flour until mixed. Generously butter and flour a 10 cup bundt pan. I mixed 1 tablespoon flour into 3-4 tablespoons butter and spread that in the pan. Preheat the oven to 350°F. Melt butter in coffee. Add cocoa powder and mix well. Let cool until lukewarm. Combine sugar, baking powder, baking soda, salt and flour in a large bowl. Make a well in the center. Whisk eggs, chocolate extract and yogurt into the chocolate mixture - blend until smooth. Pour the chocolate mixture into the dry ingredients. Use a spoon or spatula to combine and don't over mix. Pour about 1/3 of the batter into the prepared bundt pan. Spoon macaroon mixture on top making sure the filling doesn't touch the sides of the pan. Pour the remaining batter over the macaroon mixture. Bake for 50-55 minutes. Check your cake at 40 minutes just in case your oven or pan are faster. A cake tester should come out clean. Let cool at least 10 minutes before removing from the pan. 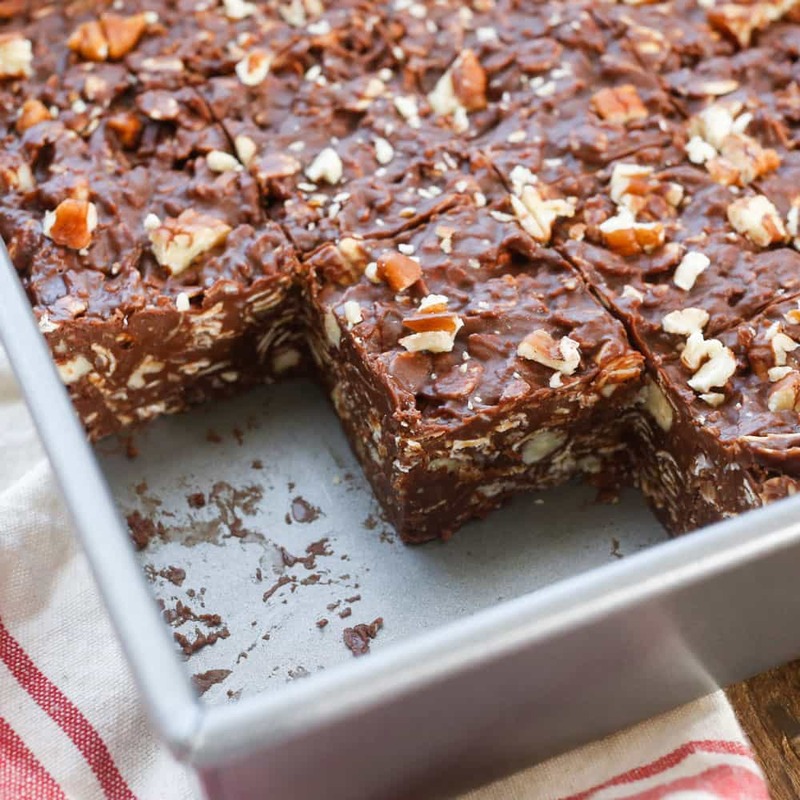 Break chocolate bars into small pieces. Heat cream until steaming. Add chocolate pieces and let sit for 5 minutes. Stir until smooth. Drizzle warm ganache on the cake. I used fine dark chocolate bars for the ganache. You could substitute dark or semi-sweet chocolate chips for the chocolate bars. If you substitute chocolate chips for the chocolate bars, use 1 1/3 cups chips. Beautiful, just beautiful ! Will make for the friends coming this weekend ! Thank you ! Thanks, Please let us know how it turns out!